Sarkozy and Merkel : June 2009 solution to May 2005 "NO" ? 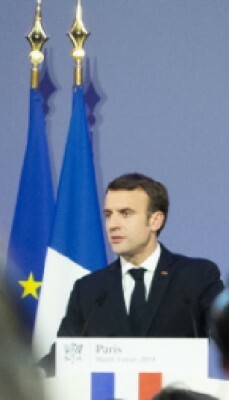 - Will French President Nicolas Sarkozy and German Chancellor Angie Merkel live up from June 2009 to their obvious Historic European mission to revitalize, and re-launch the "European Dream", after the series of 3 "NO" since May 2005 in France, the Netherlands and Ireland, by renewing, and changing the EU with fresh stimulus, big horizons, and values attractive for EU Citizens ? Whatever views anyone might have, it's a Fact that, recently, EU's political spectrum didn't produce other more charismatic and popular EU leaders than Merkel and Sarkozy, starting from September 2005 and May 2007, respectively. This trend was confirmed, in one way or another, both during the German EU presidency in 2007 (shared by Merkel with the SPD), and mainly during the French EU Presidency in 2008, (with Sarkozy "free" to move). 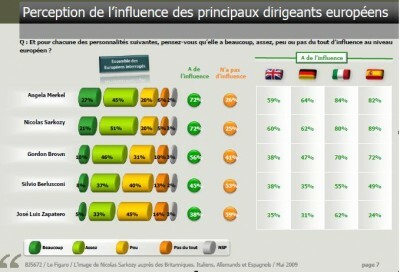 - Both with 72% Sarkozy and Merkel are considered by EU Citizens to be "the most Influential" leaders in Europe, by far. - They are the only EU political leaders to attract a Majority of "Positive" views by EU Citizens, (Merkel over 60%, Sarkozy over 50%, particularly in the continent). - 60% of EU Citizens find the 2008 French EU Presidency "Good", (and the satisfaction grows up to 67,5% in continental Europe). The Poll was made by "OpinionWay" in big EU countries as Germany, Italy, Spain and the UK, (with the only exception of France), from 26 to 28 May 2009. But the most important is that both Franco-German leaders seem willing to, at last, really start serious business on EU's indispensable renovation and Renaissance from 2009 : Year of crucial EU and German Elections. Therefore, this time, the joint European move by Sarkozy and Merkel, which just published a common Franco-German Manifesto, aims to stimulate aspirations and action not only in their respective countries, but also in many other EU "partners", as they say. "Today, more than ever, it' time for action", they stress from the outset. Facing "an unprecedented Global financial and economic Crisis", "Europeans must get resolutely involved if they want for the World which is being built to meet their Values of Liberty, Solidarity and Justice". - "We refuse a Bureaucratic EU, which mecanically applies burdensome rules and is afraid of change. We want a European Union which listens what Citizens have to say, which innovates, stimulates". This implies to "favor Research and Innovation", "Economic Coordination", to "develop real Policies on Immigrationn, Energy, Defence, and modernise common policies, particularly Agriculture". * "EU must bring immediate replies to the Global Crisis". - "Lawless liberalism failed". "The Model we want is that of a Responsible Market Economy, which favors Enterpreneurs and Workers, above Speculators ; Long-term Investment, over immediate profiits". - "We appeal upon the EU to take, from June, the first decisions to ensure a real European Regulation of Financial Markets, based on coordination and cooperation". "On speculative funds, on fiscal heavens, CEO's and financial operators' earnings, EU must give the example". * "During the German and French Presidencies, EU has resoçlutely prepared itself for the fight against Global Warming... EU is the 1st and only area in the World to have adopted a package of ambitious and legally binding rules to comply with International Aims"
- "We have now to convince our Friends and Partners, to get involved, in order to atteint, next December at Copenhagen, a Global Agreement worthy of whay is at stake. Our closer ally, the US, but also other big industrial countries, must commit themselves with the same force as the Europeans". "Green Growth is a Chance ... and an opportunity to create jobs turned towards the Future. Europe must be a leader". - But, at the same time, we must ensure that our companies remain competitive in the World. The ambitious European involvements on Climat must not lead into a position where EU industry might become a Victim of Unfair Competition. Climat protection and Competitvity must go together. If our International partners refuse to associate themselves to our efforts, we are determined to take measures to protect European Industry"
* "Europe must be more ambitious for its Industry" : "It must favor the emergence of strong European enterprises at a Global level". - "As long as an International mechanism" to "monitor Public Aids at WTO level, and hinder 3rd Countries to give abusive subsidies to their enterprises, provoking unfair competition", is "not yet set up, we must consider Transitory European Solutions". * "The current Public Debt is too heavy... We must head anew towards sound public finance, as soon as we'd have passed the crucial stage in this crisis". * Last, but not least : "Europe must play a top-level role in the World"
- "For that purpose, it needs efficient Institutions. That's why we need Lisbon Treaty". "The 27 Member States decided, last December (2008) that the Treaty should enter into force before the end of this year (2009)". To obtain that, June EU Council must agree "on the Guarantees for Ireland". - But, "to be able to act, EU needs Borders. An Enlargment without Limits is not possible", Sarkozy and Merkel stressed in an obvious reference to Turkey, etc. - "In order to be strong, Europe must assume its Values and its Identity". "Human Rights .. are at the basis of our commitment for a Peaceful Development accross the World". - "For that purpose, we shall strengthen our common Defence and Security policy". * "We are ready to contribute to activate the EU towards the realisation of these aims, with our EU Partners". "In order to succeed", Europe "needs the active involvment of all, starting by Citizens themselves. That's why the June 7 rendez-vous is important", and "we are calling all Europeans to vote". "We are convinced that, if Europe wants, Europe can", they conclude. Precisely : - What can better forge "Europe's Will" than a "European Consciousness" emerging from political, democratic struggles to face Global Challenges, and open big New Horizons, including by crystal-clear Public Debates, with active EU Citizens' involvement, before the most important EU Decisions affecting People's lives ? Precisely what "EuroFora"s project warns since 1997-2007, and unprecedented Majority Abstentions, since 1999-2004, added to 3 "NO" to EU Referenda in 2005 and 2007, proved meanwhile..